Clemson used their electric offense to end up winning 11 games and dominate a Chick-Fil-A Bowl over LSU. With 2012's ACC Player of the Year Tajh Boyd returning along with Sammy Watkins and a number of impact freshman Clemson could get back to their first BCS bowl since being blown out by West Virginia in 2011. Backfield: Tajh Boyd is ready to compete for a Heisman after passing for 3,896 yards and 36 touchdowns. After a rollercoaster of a 2011 Boyd proved to more consistent and overall smarter in his junior year. If Boyd can continue to mature in 2013 he should have an even bigger year. The backfield is now wide open with Andre Ellington graduating. Senior Roderick McDowell has the edge in a number of players in experience and ran for 450 yards as a backup to Ellington last season. Though D.J. Howard and freshman Tyshon Dye should also get their fair share of carries. Dye is extremely dangerous as he can be a psychical runner at times but also has some speed. Receivers: Sammy Watkins was a ghost in his sophomore year compared to what he did in a dream freshman campaign. He was suspended for two games, sat out another and managed just 57 receptions, with none in the team's bowl game. He is lethal when on his game, fast and agile and is fantastic when he gets in the open field. The loss of DeAndre Hopkins leaves a little bit of a gap but the Tigers have the talent to replace him. Junior Adam Humphries could have a big year and so could another junior Martavis Bryant who is explosive. Freshman Mike Williams has the size and strength to come up with tough catches. If any of these can step up the Tigers offense could be deadly. Offensive Line: Four starters remain on a very good offensive line last year. Center leader Dalton Freeman is a huge loss but Clemson should still be very good at protecting Boyd. Senior left tackle Brandon Thomas has a lot of potential. He was an All-ACC tackle in 2012 and has the size and mobility to be very dominant this season. The other starter on the left side, guard David Beasley, had a strong sophomore season. He'll be a big part of an evolving ground attack. The top candidate to replace Freeman at center will likely be sophomore Ryan Norton who has the potential to have a strong year. Freshman Tyrone Crowder isn't big standing at just 6 feet but he is extremely athletic. Although he may not play a lot of snaps this season he should be considered the future at the guard position. Defensive Line: Clemson lost their star defensive end Malliciah Goodman but their D-Line is still pretty strong. Junior Vic Beasley is the team's leading returning sack leader after recording 8 in 2012. He has the speed and strength to constantly disrupt opposing backfields. Defensive tackle Josh Watson has proved that he can fill running lanes with his big body. He is also very experienced like a lot of this line. 6-5 end Corey Crawford and nose guard Grady Jarrett also have experience and are both strong pass rushers. Clemson also managed to bring in a number of freshman who could make an impact. 6-4 end Shaq Lawson could be one along with four-star Brooklyn product Ebenezer Ogundeko. 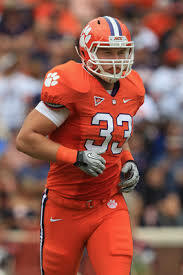 Linebackers: The return of 2012 leading tackler Spencer Shuey will be huge for Clemson this year. A senior, Shuey's experience allows him to read plays well and make tackles (he had 93 total last season). As Shuey racks up tackles in the middle, junior outside 'backer Stephone Anthony does it all over the field. He was fourth on the squad in tackles in '12 and could get even more this season. He also is pretty solid pass rusher as teams tend to focus on the Tigers' great defensive line leaving holes for him. On the other side the Tigers get a lot of production from senior outside linebacker Quandon Christian who can also rack up a lot of tackles. Inside linebacker Ben Boulware should also be an instant contributor being a four-star prospect. With a solid line and Shuey and Anthony teams shouldn't be able to run all over Clemson which has happened in the past. 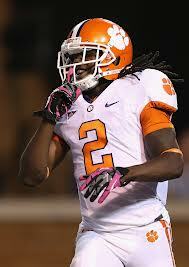 Secondary: If Clemson wants to win the ACC and get back to a BCS bowl their secondary needs to play well. That is going to be tough as three important defensive backs are now gone. Junior cornerback Garry Peters is the lone returner and needs to have a big year. He has great coverage skills and should improve with some more experience. Starting at the opposite cornerback position looks like it will be senior Darius Robinson. Robinson is small and does get pushed around a bit with more physical receivers but he is extremely quick. Junior safety Robert Smith looks like he'll have a good year after playing just occasionally in 2012. Young and inexperienced sophomore Travis Blanks appears like he will start at the other safety slot. He has some weaknesses in his game though. The Number 4 overall freshman this year, Mackensie Alexander should spend some time at cornerback. He is a ball hawk with great instincts and awareness. He is ready to come in and be an important contributor. Once again the Clemson Tigers have the talent to win the ACC. Though this year their defense must be above average and Tajh Boyd must continue to make smart decisions. If all things fit together well an ACC Championship is on the horizon.